When you decide you want to plant a flower garden, there are several factors you need to consider. The location you plan to plant your flowers will determine whether you need flowering plants that prefer full sun or partial shade. You may want a theme, like Victorian, Mediterranean or Asian, or you may want to plant by color. Using popular flowers in your garden will mean not only that your garden appeals to all, but you will have an easier time finding the flowering plants you want to plant. Of all the flowering plants available for gardens, the rose is by far the most popular. The wide range of varieties for a gardener to choose from, from tiny miniature roses to large blossoms with vibrant colors, makes roses the most popular flower to grow in your garden and landscape. You can find a rose variety that will grow and flourish in any USDA zone. Give your rose sun, water and proper care, and you will have glorious blooms throughout the summer. Many gardeners like roses so well, they plant an entire flower garden with them. Perennial flowering plants come in all shapes, sizes and colors and are favored by gardeners because, once planted and established, perennial flowering plants will live and grow in your flower garden from one year to the next. Popular flowering perennials for your garden are day lilies, daisies, black-eyed Susan's, purple cone-flowers and chrysanthemums. Many popular flowers that begin with bulbs can be considered perennials. Daffodils, irises, hyacinth and many lilies are a few of the most popular bulb and rhizome flowering plants for gardens. 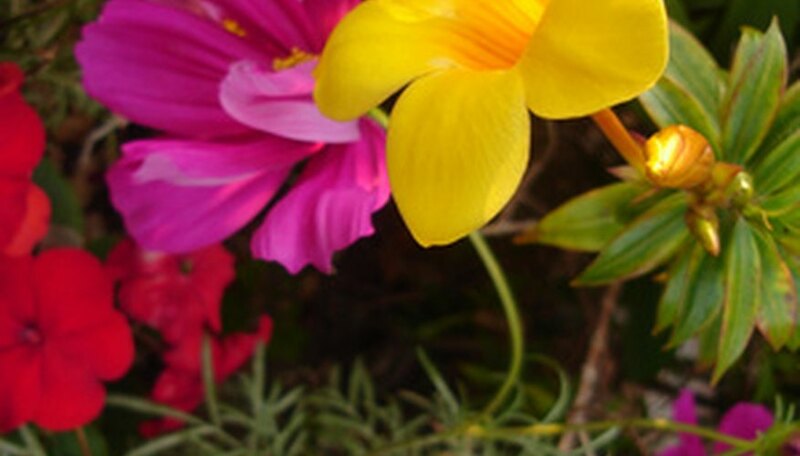 Biennial flowering plants, in general, are not always a first choice with flower gardeners. As the name suggests, biennial flowering plants take two years to develop and flower before the plant dies. Hollyhocks, stock, forget-me-nots, foxglove, sweet William and evening primrose are some of the most popular biennial flowering plants. Plant in the summer and care for them the first year; let them rest over the winter; and the following summer, you will be rewarded with lovely blossoms. Petunias, alyssum, marigolds, cosmos, zinnias, pansies, impatiens and sunflowers are very popular annual flowering plants and can be found in almost any garden. Even though annual plants only live for one year in your garden, the vivid blossom colors that will continue to bloom throughout the growing season are the main appeal for gardeners.